At the end of the season four finale, a young girl named Madi was at Clarke’s side. We have learned that Madi was “adopted” by Clarke, and has taken her under her wing. She is driven by being the best mom she can be to Madi, as she is the only person that the younger girl has. Now, with the new danger landing, Clarke will soon discover that her maternal instinct and protection will take shape. This will indeed be a new and wonderful journey for Clarke, and somewhere in the back of my mind, I always pictured Clarke as a mother. Perhaps not in the common direction that we are all aware of, but I think that this introduction of her new role is more emotional, sweeter, and befitting to the narrative. Forget caped comic book based everyday Joes and Janes transformed into crime-fighting Avengers. The real heroes that Madi idolizes are the ones who fought to conquer and survive in a troubled and dangerous world consumed with monsters. Real monsters who stolen free will and committed inhumane acts upon others are extinguished thanks to the wits of the delinquents. From the stories and real-life experiences Clarke shared with the young Nightblood, she feels like she is connected to them. And just maybe she is. As the season will roll on, Madi might see just how important and special the delinquents really are. No, Bellamy is not going to join the legion of Transformers. Though, how rad would that be if he can evolve into an airplane? What really is going to happen is that Bellamy will be more of a Pacifist and a better leader than before. He just might think before acting upon his actions, because in a few instances that he didn’t, things did not bode well. However, we can argue about the psychological aspects of his behavior, but Bellamy certainly did redeem himself. Now that he has grown up a bit, he will be more trusting with his leadership and will teach Clarke on how to take on a more holistic approach. Clarke on the other hand just might be the opposite of who she was. And, with perfectly good measure as Clarke has a child to take care of and protect. Okay, so I ship Bellamy and Echo, call me crazy. But, there is no denying the fact the two has chemistry since their Mt. Weather days. Being on the ARK will be new to Echo, who never knew life except on Earth, and very familiar for Bellamy, who knows the system all too well. However, being together on the ARK would indeed cause a developing dynamic for the two ex-foes, but Morley dismissed the topic of the relationship at Comic Con. Which is understandable. And since Tasya Teles has been promoted to series regular, we will be seeing a lot more of Echo. With the new “relationship,” however it may be, and with the time jump, will dictate Bellamy’s characterization in season five. Clarke won’t be the only one sporting a new look as Octavia will have a new one as well. Both in the outer appearance and soulful sense. She will have to take even darker alleys to keep the peace at bay in the bunker. She is, of course, the de facto leader of the 1,200 habitats. Her “plan” will be brutal, but necessary, according to the Comic Con interview for TVLINE . Yet, not only will she be more affluent in leadership because this was a job that she was thrown into, but Octavia might also be rocking a new look too. Rothenberg and Marie talked about a potential new look for her, but nothing has been set in stone. It would make sense though as a physical change, especially with one’s hair often symbolizes a new life setting. One thing for sure is that Octavia is definitely not the same girl who wanted something more in life than being the “Floor Girl” that was introduced in season one. This is a no-brainer. Since season one, Bellamy and Clarke always backed each other, regardless of differences, but always wanting to do the best for their people. It’s always evolving, and though I do not ship more than just best friends, it’s positive and concrete that they have magic. I do not mean to let down other TV relationships (platonic and mutual), but Morley and Taylor give us the very best of their characters and it’s easy to say that they’re amazing together. In fact, Clarke’s radio messages to Bellamy will be addressed in Eden, the season five première. Just how Bellamy will react to them? Well, we won’t have to be impatient to find out. And the reunions of everyone will also be in close timing. Just what happened between Murphy and Emori, and Monty and Harper? What caused these happy, in love couples to drift apart? Perhaps it was the high amount of stress in space, worrying about the ARK breaking up, and coming back down to earth after a nuclear holocaust, and believing that one of their most beloved leaders is gone forever. That can lead to little time for relationships. Another theory that has been floating online in the fandom is “Space orgies.” Now, I don’t think that this is far-fetched, as these people are young, and relationship troubles can cause rebounds. Plus, non-stop boredom. We might see pairings that we never thought possible, like Murphy and Raven. However, the thought of these couples breaking up is tragic. Raven Reyes has always been the intelligent one next to Monty, but as new dangers lurk around the corner, she will find new ways to protect herself and others. This was asked as a question at the panel, if the casr will acquire new hobbies. Raven did say that she wanted to learn combat training., and Rothenberg replied, “You will.” I wonder who her mentor will be? This one is somewhat hard to imagine, as people are going to be intimate (Kabby), and maybe they want to have a child of their own. Plus, after six years, the world does need to repopulate and regrow. But given the circumstances, having children would not be ideal. The probing question is how was childbirth prevented? Did Abby (As hard as it was to do for her, as I am sure that everyone would like a little Kabby kid running around) and Jackson create a birth control so that no births can be allowed? The bunker is a lot like the ARK, with very limited resources and it will be very problematic if the population was not under strict control. But, it does not heal my disappointment of little Spacekru babies. Six years is a long time jump, and lots of things can change and happen between then. Luckily, The 100 is gifted with flashbacks, offering peeks of characters’ lives and events before the present. We will once again experience these flashbacks, seeing how the character changed and applied themselves in those six years. It will be something to look forward to in season five. We will see flashbacks of the Spacekru, Wonkru, and the prisoner ship, hopefully, filling in the blanks of our many “What happened?” questions. A little after our present, but before the 2152 war, the prisoners on the ship had lives. And, thanks to terrific, no-aging science hyper sleep (Sign me up for I want to be young forever), they stayed their ages. So, these people knew about the sights and scenes we often take for granted. Things like shopping centers, movie theaters, television programming, and other simple, everyday things. But, the main focus here is how they will act and communicate with everyone else. They won’t be peaceful, and they will be a new threat. But, eventually, they will come in terms of the matter. Maybe Eden will be gorgeous in the superficial aspect, but that is it. Rothenberg confirmed that it will indeed be the greatest battleground for survival. Eden will not have enough land for every soul, and therefore, war is evident. It will be between the three factions, Wonkru, Eligius, and Spacekru, and how they will decide on who gets to live on the one tiny piece of the planet that is livable will be harsh. And, what is worse and stressing is that Clarke now has a young child who will witness all of this. Well, The 100 is definitely not one for happiness, so try to keep that in mind. These will be the main themes of the fifth season. Characters will have a “rebirth” such as Clarke will be the new Grounder, Wonkru will be the new Mountain Men (Hopefully, no inhumane medical experiments), Eligius will be the new prisoners landing on Earth, and Spacekru will be the peacekeepers. I am not positive on what Spacekru will be, but that seems like a good guess. It feels like a full circle, and that is usually how life operates. As for regeneration, the earth will begin to heal after Praimfaya, making it habitable once again. Hopefully, that is what happens. There will be three new characters coming. One of them will be the female leader of Eligius, and powerful. As for the other two, they remain a mystery, and whether or not if they will be evil and threatening. There will be a new love interest thrown into the mix. Abby Griffin is alive and well! When she will be reunited with her daughter, Clarke, she will get a surprise as she will meet her adoptive granddaughter. Their relationship will find new light as Clarke is now a “mom” and Abby will adjust accordingly to that. Hopefully, all of our other side favorites be alive as well. And, I am implying everyone. (Jackson, Miller, Niylah, Indra, Roan). Hey, I still have strong hope for the guy! 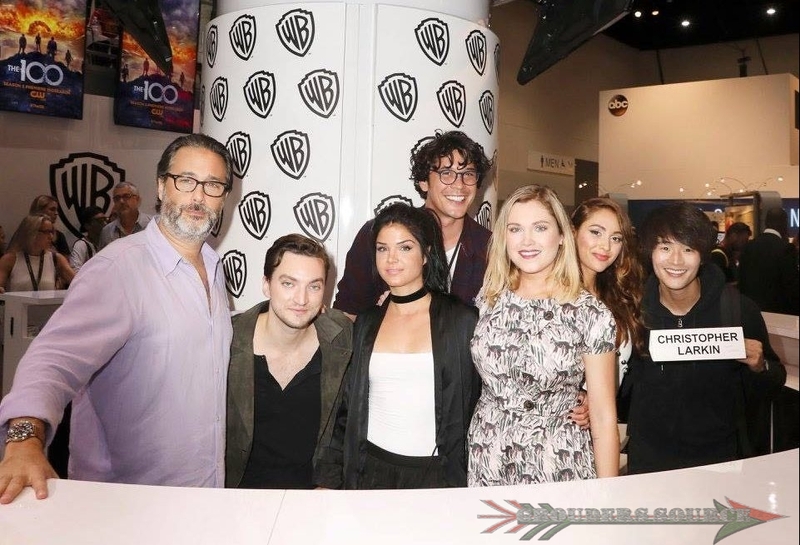 You can also see Comic Con 2017 videos on the Grounders Source Youtube channel. I will be adding more! Are you guys excited for season 5? You can add your two cents in the comments below. The 100 season 5 will première with Eden in early 2018. Follow Grounders Source on Twitter and Facebook to keep up with the latest The 100 news. You can also leave a comment below.